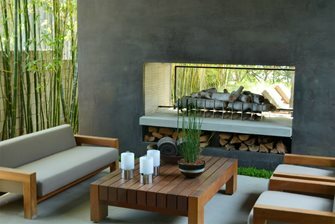 This two sided modern fireplace illustrates how neutral gray concrete can become a swanky choice for outdoor living spaces. Concrete block lends itself to the popular long low fire features of modern projects where gas is used to reduce smoke and eliminate chimneys in favor of vents. 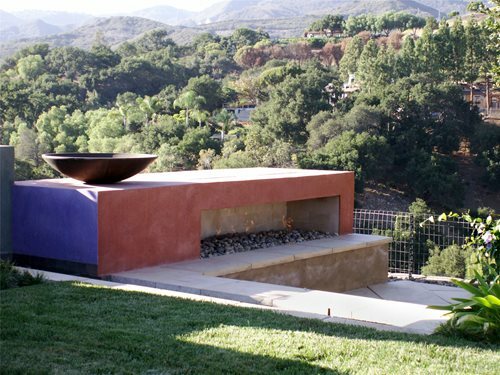 Poured in place fire features may be left natural concrete color, or admixes can be used either in the wet cement or applied to the surface. They will also accept certain stains or paints to create bold color effects. Concrete is most often used for modern style fireplaces where the look and feel of the material is left exposed. 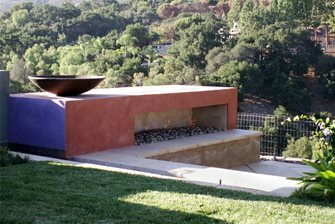 The ability to pour concrete into wood forms makes it adapt very well to massive fireplaces that double as significant elements in the landscape. They are rarely wood burning and most often fired with natural gas or propane. The lack of a defined chimney possible with gas gives concrete fireplaces their own unique look. One of the most popular forms today are long and low, sitting down into the landscape. These linear fire features or when built in a corner unit offer lots of seating options as well as easy maintenance. However, these are most often seen in mild winter climates where concrete is less likely to suffer cracking from the effects of freeze thaw. Concrete is also used as a core for fireplaces built on site from scratch. This core may be poured in place or concrete block is used. "All of our outdoor fireplaces are custom built," says Corey Bittner of Neave Group, New York. "We use block faced with veneer on concrete footings. They'll be there forever; they'll never fall apart. We often incorporate wood boxes and shelves and sometimes TVs as well. 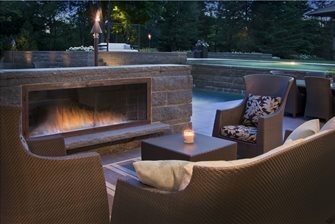 Glass fiber reinforced concrete is now being used for prefabricated, bolt-together fireplace kits that are modular with some accessory options. They arrive ready to use, and require no cladding and minimal hook ups.